This Modiano deck is 100% plastic and is made by Modiano Company. Modiano Texas Holdem marked playing cards are typically 20 times as durable as their plastic coated counterparts. Plastic Decks are also waterproof, will not show wear, are resistant of damage, and will deal with professional ease. The Texas Poker has a jumbo index that is ideal for any poker game including that of Texas Poker. Different back color of the cards, we use different solution to mark the cards, such as luminous ink kit and marked cards strategy, each deck of cards can be marked perfectly. 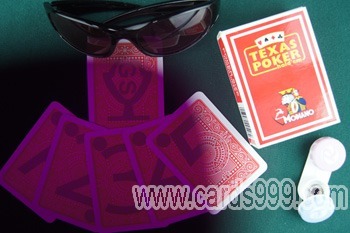 Our magic marked cards can use luminous enhancing sunglasses to see through cards; also can use marked cards with contact lens to see the marking cards with invisible ink, for we use invisible ink printer and special juice dust to do the thumbs up marked playing cards. Red, pink , orange cards: marked with big font in the middle or small fonts in 4 corners (white or black marks).